2011 will have the same amount of Doctor Who, but it will be more evenly spread throughout the year. If you're a big fan of the new Doctor Who, you'll be familiar with the dry months between the end of one season and the start of the next. Sure there's the Christmas special, but that's just a tiny drop in an otherwise Doctor Who-less few months. 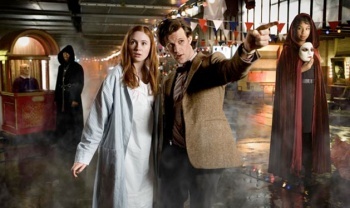 But next year will be different, as show boss Steven Moffat has decided to split the season into two parts. Speaking at the Edinburgh TV Festival in Scotland today, Moffat said that he felt the show needed a big event in the middle of the season. He said that a Doctor Who season was 13 episodes long, which was enough for two seasons of most BBC shows, so rather than show them all at once, it would be split into two blocks, one shown in the spring as usual, and the second shown in the fall. He added that the spring series would "build to an Earth-shattering climax," calling it a "gamechanging" event for the character. In a BBC press release, Moffat also said that the split series meant that fans would be treated to twice as many season premieres and twice as many finales. It sounds like the loose story arcs of previous series might not be quite so loose when the show resumes next year. When you've only got seven episodes - which is how long the blocks will be - and you're building to some big event, it doesn't leave a much time for a lot of side stories.